Here’s the Hotel Winters on a postcard, probably from around 1910. It’s a hand coloured black and white photograph, so the bricks haven’t really changed colour. You can see that most of the building looks as solid today as when W T Whiteway designed and supervised the construction in 1907. These days it’s a Single Room Occupancy residence for low-income residents. There’s been some confusion in the past over who built the hotel. There’s general agreement it was a Mrs Winters, and Avis Winters, wife of Richard was living with her husband in the city in the 1891 census (he was aged 37 and she was 28). Richard Winters was from Nova Scotia, and Avis was from Ontario. Richard was a barber in Victoria in 1884, but was on the Vancouver voting list in 1886 as a tenant of Jonathan Miller, and in 1888 applied for a licence for a saloon on Dupont Street (today’s East Pender). In 1906 Mrs Winters was listed as the widow of Richard, and living on Hornby Street. Some references suggest her husband, William, built the hotel for her, but there’s no sign of a William Winters in the city – it’s probably a confusion with William Winter who owned the Granville Cafe. 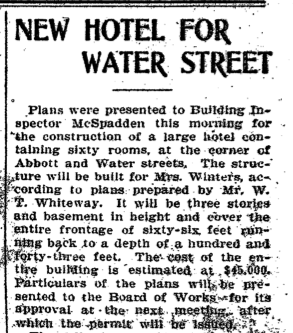 Thanks to Patrick Gunn’s diligence we now know the December 1906 building permit confirms that Mrs Alice M Winters was the owner, William Tuff Whiteway was the architect and the 3 storey hotel would cost $45,000. From the postcard it’s obvious that the building ended up as 4 storeys. (We still don’t know why in the census she’s Avis, and in most other contexts she’s Alice). The advert for the new hotel suggest the proprietors were C N Owen & Co – but they probably just ran it on for Mrs Winters. In 1908 and 1909 she ran a tobacco shop and a pool room in the retail space under the hotel with her nephew, Thomas Stevenson. In 1908 the hotel was described in glowing terms in the Greater Vancouver Illustrated publication. “Hotel Winters was designed and was erected specially for a hotel replete with every modern and up-to-date convenience known to the business. It is constructed of red pressed brick, with cut stone trimmings. The lobby, buffet and reading room are laid with mosaic tiling, the lobby having a lofty ceiling and being a spacious and well-lighted room. The furniture is of golden oak, with which the trimmings are In perfect harmony. There are one hundred and twenty luxuriously appointed rooms in the hotel, a part of which are en suite, fifty of the apartments provided with private baths. All rooms are exceptionally well lighted and airy, are provided with steam heat, hot and cold water, telephones and such other modern conveniences as are usually found in the best and most modern hotels. The dining room is large, beautifully lighted and elaborately decorated, and has walls and ceilings paneled with heavy plaster staff relief work. The service is of the very best, and guests pronounce this one of the most satisfactory places to dine that can be found In the city. The hotel is conducted on the American plan and rates are reasonable, considering the high class accommodations secured. The proprietors of this excellent hostelry are A. M. Winters who built same, and after whom It Is named, and Thos. Stevenson, the latter being the active manager. Mrs Winters seems to have done well enough with the hotel, which was $1 a day on the European Plan but $2 on the American Plan (with meals). In 1911 she had Somervell and Putnam design a house for her in Point Grey, although successfully avoided the census that year. McLennan, McFeely and Company Limited were the city’s most successful importer of hardware and building supplies at the turn of the 20th century. In 1906 they built themselves a massive new warehouse on the corner of Columbia and East Cordova, hiring E E Blackmore to design it; (the son of William Blackmore who designed the adjacent Commercial Block). Both McLennan and McFeely were in the city before the 1886 fire: Robert Purves McLennan was from Pictou, Nova Scotia and had run a hardware store in River John before moving to Winnipeg in 1882 aged 21. Edward John McFeely was from Lindsay, Ontario, was two years younger than McLennan and also sought his fortune in Winnipeg in 1882. The future partners met there and worked together, but the boom ended quickly (his biography calls it ‘the real estate reaction’) and he headed to Minneapolis. McLennan had gone to Victoria in 1884, establishing an ornamental ironwork and tin cornice company that expanded rapidly. He invited McFeely to join him in business and they bought a lot on Powell Street in Vancouver to build a warehouse. The frame was up when the fire destroyed the town, but apparently the lumber it was built from was still wet, having been floated in a raft, so it didn’t burn and they were able to complete it quickly (covering it with corrugated iron) and cash in on the building frenzy that followed. During the 1890s the firm’s focus shifter from roofing and tinsmithing to wholesaling. In 1891 McLennan had 13 people working with him in Victoria and McFeely 17 in Vancouver. Further buildings followed; in 1889 their business ‘stoves, tinsmiths and plumbers’ was in a 3 storey building designed for them in 1887 by Elmer Fisher, on the 100 block of Cordova, the main business street of the day. It was apparently extensively covered with the company’s own decorative metal trim,and the city’s library was for a while in a rented room upstairs. In 1900 GW Grant designed a new warehouse on Pender, and in 1905 E E Blackmore and W T Whiteway designed a new warehouse on Water Street that was completed, but never occupied by the company. Hardware and Merchandising magazine explained “McLennan, McFeely Company, Vancouver, have leased the block that Contractor J. McLuckie is erecting on the corner of Water and Abbott streets to the Fairbanks Company. The block will be three stories high, and the estimated cost is $30,000. It will have a private siding from the C. P. R. and, being right on the waterfront, is well located.” Instead they commissioned this massive (150,000 square feet) warehouse on Cordova at Columbia in 1906. In fact, they commissioned two buildings for this site – Parr and Fee designed the building on the left for Cordova and Columbia at some time before 1900 – as far as we know it was never built. Our top image shows the building in 1910; the one below shows it in 1920. 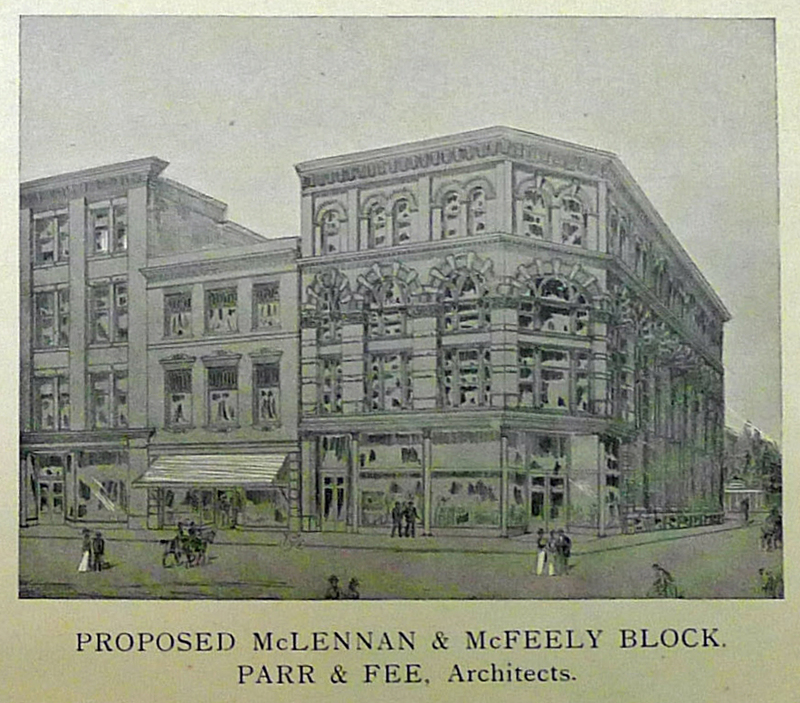 Both McLennan and McFeely became important members of the city’s business establishment. Both were associated with the Board of Trade, and Robert McLennan was also on the School Board, a member of the Board of Governors of UBC and President of the Bank of Vancouver. Edward McFeely owned a motor yacht, the ‘Jolly Mac’ in which he cruised the BC Coast. Robert McLellan owed a 330 acre farm on Gambier Island with extensive orchards and a prize dairy herd. McFeely was mostly responsible for running the Vancouver operation; McLellan supervised the Yukon operations for five years from 1898, his family joining him every summer. He even became mayor of Dawson for a year in 1903 (having sold the retail side of the business in 1902), but in 1904 the remaining operations were sold and McLennan returned to Vancouver. A third partner, E G Prior, was added in the late 1920s to create McLennan, McFeely and Prior Limited as the company continued to expand after Robert McLennan’s death. Edward McFeely was married in Victoria in 1889 and there were six children. Robert McLennan married in Nova Scotia in 1887 and had ten children, including one born in Dawson City in the Yukon. McLennan died in 1927, and McFeely in 1928, one month after retiring. In the 1970s the Koret clothing company from San Francisco occupied the building, and the residential conversion completed in 2006 still bears their name. The Koret Lofts has 118 live-work units with an extra floor added to the building with the conversion and restoration designed by Simon Bonnettemaker at Gower Yeung and Associates. Here’s the Edward Hotel (or Hotel Edward when it was first completed in 1907). It replaced the Regina Hotel – the only substantial structure to survive the 1886 fire). We haven’t found an architect, but thanks to Patrick at Heritage Vancouver Society who dug up the details, we know it was built for Charles Edward Beckman at a cost of $21,000. He was a Swede who arrived in the city in 1899. In 1901 he was a mining engineer, living alone (as a lodger at 512 Seymour Street). There are several other Charles Beckmans, all Swedish, scattered around BC and Manitoba at that time as well, and another engineer at a mill called C E Beckman. In 1906 he was still a mining engineer, with a house at 528 Seymour, but he appears in 1907 as proprietor of the Hotel Edward. A year later he’s no longer in the city and the hotel was being run by John W Deptford. It looks like Beckman may have returned to Europe as he seems to have emigrated to New York in 1913 via Hamburg. Mr Beckman had initially run into a few problems with obtaining a licence for the new hotel as Mr Wallbridge, the previous owner of the Regina had apparently sold the licence with the hotel, but also transferred it to Thomas Foster who was the lessee of the Regina, and who therefore thought he controlled the licence. The Board controlling the licences appear to have agreed to grant two – one to Foster and one to Mr Beckman. In 1908 Mr Foster was running the Oxford Hotel at 38 West Hastings. The new owner who bought the hotel from Mr Beckman, John Deptford, was a police officer before he took over the hotel, living on Barnard Street in 1907. He had the right background to run a successful bar and hotel. John came from Upwell in Cambridgeshire where his father (also John) ran a public house. His other advantage was that as a former Vancouver policemen he knew exactly what he should – and should not – do to avoid falling foul of the law. In 1906 the new board of police commissioners tried to enforce the observance of the Sabbath by hotel and saloon owners – in theory the bars were closed. The police were reluctant to enforce the law, claiming they couldn’t see if a bar was open or not. A new by-law was immediately introduced requiring a light over the bar and a peephole to view it from outside. It was suggested that the police – presumably including Constable Deptford – might have been helped financially to not look into the bars, but now they had little excuse. Nevertheless, when the proprietors of the Columbia Hotel were charged with supplying after hours drinks the charge was ‘providing an inadequate peephole – as the slot they created in the shutters didn’t allow a view of the bar. In their defence they suggested Constable Deptford could have seen in if he had stretched his neck – “only if I stood on a box” he is said to have replied. The magistrate remanded the case but required a bigger hole. In 1909 J W Deptford hired E E Blackmore to make $700 worth of alterations to the hotel – so that might be who designed the building a couple of years earlier. J W Deptford and his wife Ellen both arrived from England in 1899, and the 1901 census shows John working as a labourer. The couple married in Vancouver in 1900; Ellen was from Salisbury in Hampshire, was five years older than her husband, and had no complications with changing her name as she was already Ellen Deptford before she married. In 1891 she was working in London as a servant. In 1911 Ellen was listed a hotel proprietor. and in the Street Directory John is identified as owner of the Alexander Hotel (at 1 Water Street – originally the Alexandra), and they were living on 7th Avenue. We don’t know what happened to John, but Ellen died aged 90 in Cambridgeshire. Both John and Ellen travelled out of North America, through Quebec in 1905 and New York in 1910. Today the building looks much as it did when it was built. The Water Street Cafe is downstairs, and there are offices rather than hotel above. In 1919 it was given a new storefront, designed by Dalton and Eveleigh, and what’s there today looks very similar. Our 1920 VPL picture shows the building when R S Ford, importers, had taken over the building (around 1919 – presumably when the new store front was added). As you can see from this 1944 image, the Yale Hotel has been called by that name for many years. When it was first built in 1889 it was called the Colonial Hotel, and it was hooked up to the water system in July of 1889 a few months after the Golden Gate Hotel a block to the north, although the Yale wasn’t advertised as complete until 1890. It was designed by N S Hoffar who seemed to have designed eight or nine projects a year in the city at this time, and built for J W Horne, a keen investor in land and buildings with a close connection to the CPR. At one point his assets were said to be second in value only to the CPR themselves. While it’s been stated that the building survived the fire having been built as a bunkhouse for the CPR, there’s no evidence that this is true. The construction of the hotels coincided with the construction of the electric streetcar on Granville Street. H P McCraney, in conversation with Major Matthews, recalled the first year of building the railway. “In the spring of 1889, I commenced operation in building the first street railway in Vancouver. The first track was laid on Granville Street, a little north of Pacific Street, perhaps a hundred feet north, where the slope runs up to a level. We started just at the level so that the horses may have an easy start when they pulled. The track was to run from bridge to bridge through the town. At that time, the Granville Street vicinity was mostly stumps, although down in Yaletown, a couple of hundred yards east or so, there was quite a little settlement.” When it was being built it was to be a horse-drawn railway; the decision to electrify the line was taken while construction was underway. Yaletown was a small area with a collection of houses further east, on Seymour and Richards. It took its name from the town of Yale, the CPRs interim base while the tracks were being laid to the coast. Several of the houses were older than the city itself; 1371 Seymour for example was carried in pieces as lumber and re-erected. Some houses came ready-built on rail company flat cars. The CPR built their new Drake Street Yards and Roundhouse in 1887 – which was fortunate as the Yale machine shops burned down in 1887. In 1907 the hotel name was switched to ‘The Yale’, which it has been ever since. The eastern addition to the hotel was built in 1909, designed by W T Whiteway for Marquis de Biddlecope, who we introduced when he built the St Francis Hotel. Today the Yale has just undergone a comprehensive restoration and seismic repair that will see the SRO rooms upstairs and to the east reopened, and the bar noted for its blues back with a new sound system. The store fronts have been rebuilt to match the original building far more closely than before the makeover, and the 1950s neon sign reinstalled.